It seems that one of the identifying features of Windows Phone handsets isn't being killed off in the Windows Phone 8.1 update. There have been rumours milling around that the back button was going to be completely dropped, although it seems more likely that the Redmond-based firm is merely dropping the requirement that manufacturers need to include one. That would pose a few questions, as removing the back button would cause some problems, with many Windows Phone apps built around the functionality. 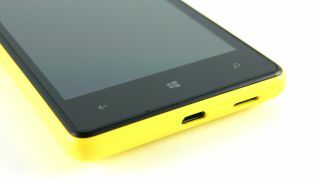 Windows Phone to go Nexus style? In order to combat this, sources talking to The Verge suggest that on screen buttons will replace the current Back, Home and Search keys. This could mean a Nexus style bar at the bottom of the screen. Removing the requirement for a back button is also a way that Microsoft might be looking at reducing the manufacturing costs of future Windows Phone handsets. This isn't the first time that Microsoft has relaxed hardware requirements, with a need for camera's already having been removed.